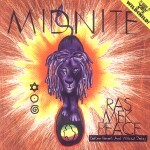 Midnite captures the essential qualities of roots music with their latest album Ras Mek Peace (Before Reverb and Without Delay) released on Mapleshade's Wildchild! label. Reggae - naked and raw is perhaps the best description that can be given to the 60 minutes of superb musical works that can be heard on this album. Ras Mek Peace was recorded using only 2 tracks, one for vocals and one for instruments. Incredibly, the tracks were put together using no mixing board, no filtering, no compression, no equalization, no noise reduction, multitracking or overdubbing. Ras Mek Peace features extended hypnotic rhythms punctuated by rock solid bass grooves which are personified on the track Hieroglyphic. Midnite exposes the pitfalls of babylon on songs like Pagan, Pay Gone, In The Race So Far, and Banking In The Pig. Their faith and livication is revealed on Lion Wears The Crown and Rasta Man Stand. Founded in St. Croix in 1989, Midnite features the rebel roots and cultural lyrics of "old school" reggae set to the rhythms of today's world experiences. Since the release of their first album "Unpolished", they have toured the East Coast extensively and have played in South Africa. Armed with a solid spiritual foundation and an artillery of original works, Ras Mek Peace features songs of freedom, culture and universal love that are not to be overlooked.